There is no doubt that the theme of this show was immersive sound, across the trade show flow as well as in the convention part too, with day 4 featuring the Immersive Audio Super Saturday sessions will utilised a large-scale 9.1-channel system from PMC and, for binaural sessions, a Sennheiser wireless headphone system. From Xenakis to Doctor Who, and spanning VR, broadcast and music production, the sessions draw from the Convention’s Game Audio & VR, Broadcast & Streaming and Recording & Production tracks. In the “Binaural Listening Experience” session, Marta Olko of New York University presented a selection of binaural recordings and mixes from various artists, composers, and recording and mixing engineers, all created to highlight the ways in which binaural audio can complement and enhance the music. Immersive audio is also a vital component of virtual reality gaming. In “Create Sound and Music for VR and 360 Using Common DAW Workflows,” Tom Ammermann of New Audio Technology GmbH focussed on the latest initiatives and developments of virtual and augmented reality development centres worldwide, including the first publicly-funded VR/AR lab in the US, located in New York. For me, the highlight of the trade show was the Avid Partner section on their stand where a large number of developers were able to have booths to show off their products. These booths were constantly busy, which is another good sign. PACE iLok - It was great so see PACE iLok at the show with a booth demonstrating the new cloud-based licensing system. What was interesting to learn, is that the new cloud-based licensing system will need a continuous internet connection to work. What this means is that if you want to work where there isn't internet or on systems that are deliberately 'air-gapped' for security, or you are in locations without internet access, then the cloud-based licensing system isn't for you, but as long as you have an internet connection it does away with the need to carry an iLok on the road. It will be interesting to see how software publishers choose to offer the iLok cloud option, whether they will offer duplicate licenses for owners of iLok licenses or some other model. Although the machine based authorisation option that iLok offer is acknowledged as not as secure as the iLok system, we understand a key part of the cloud system design was that it should be as secure as the iLok system, which may explain the need for a continuous internet connection. Sonible - I was very impressed with the 3 Sonible products. First up was Smart:EQ+ which analyses your audio material, identifies spectral dysbalances and suggests EQ curves that are designed to add clarity and punch to select frequencies or entire tracks. The demo that I heard gave space and clarity to a jazz recording. Next up is proximity:EQ+. This is an EQ plug-in that is designed to reposition audio sources in post-production. So it is a Dereverb plug-in but it takes a different approach so it is designed to edit natural reverb, offer frequency-selective dereverberation and isolate and remove room modes and sounds remarkably natural as far as I could tell listening on headphones on the trade show floor. Finally, there is entropy:EQ+ that is an EQ plug-in that is designed to adjust the harmonic and noise components of audio recordings, enabling you to control frequency-selective transients/tonal balance, manipulate sound anatomy with surgical precision, and is designed to improve intelligibility of speech. Again this is an interesting take on the harmonic and transient design world of audio processing, and listening to the demo offering a completely differnet set of options. 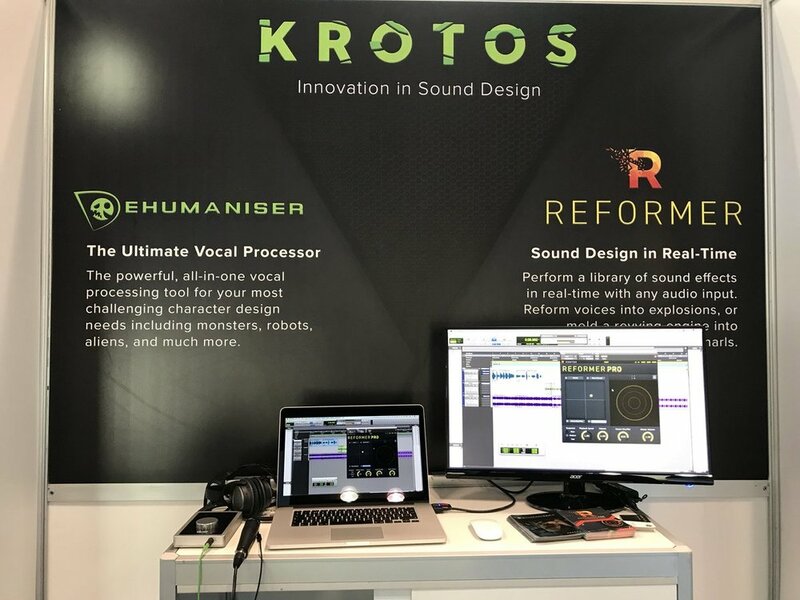 Krotos Reformer Pro - I had some fun at the Krotos stand with their latest product Reformer Pro, which is designed to enable you to analyse and design in real-time using your own sounds, by blending up to four sound libraries using the intuitive, tactile X/Y pad, and customise response times for each source, then be able to tweak playback speed and volumes to taste. It comes with a library of sounds and whilst playing with it on the sound I was able to vocalise a tiger, create leather seat foley, and change a prerecorded footsteps track to leather shoes. Nugen Audio Halo Upmix - Nugen Audio continues to develop for the immersive audio field, announcing another update to its Halo Upmix 3D Immersive Extension. Having launched first order Ambisonic output capability in July, this latest upgrade will allow second and third order Ambisonic output with support for both the AmbiX and FuMa formats. In addition, the Halo Upmix 3D Immersive Extension update will also include both 7.1.4 and 5.1.4 channel configurations to facilitate production in Auro-3D formats. Dynaudio New Subs - More compact subs were missing from the Dynaudio range, but not any longer. There new 9S and 18S subs feature long-throw 9.45in (24cm) woofers that are designed to be equally effective for stereo and surround monitoring applications, handling the ultra-low frequency range, being at the heart of these subs. The 9S features one woofer and the 18S has two in a push-push opposing design with a woofer on each side and Dynaudio claims that the performance of the 9S is comparable to the larger BM 14S II sub. DAD Adds Speaker Correction for AX32 - With the new Version 3, as an integrated part of the AX32 and DX32 units, DAD now offers the desktop Monitor Control Unit, with layered control functionality. By adding the new SPQ Speaker Processor card to the AX32, 128 channels with 1024 filters can be allocated to the outputs of Pro Mon, all with a 56-bit floating point calculation precision, giving a filter dynamic range of > 130dB. With the Pro Mon 3 license, a range of additional monitoring control features are added to the DADman software, enabling AX32/DX32 to operate as a processor with control of signal routing, control room speaker levels and monitor cues in any channel format including stereo, 5.1, 7.1.4, Dolby Atmos and other 3D and immersive audio formats. The control and configuration are managed by the new DADman 5.1 software, which also serves as a control centre enabling devices compliant with Avid Eucon or MIDI to operate the monitor functions. The convention and technical papers section of this show was a major draw for me. As you can see from the timetable for just one day, there are a large number of strands all with high calibre people presenting their experiences and sharing their knowledge. The first session I want to highlight was "Spatial Audio: SA02 - Riding the Faders: How to Stay Ahead of the Curve in Immersive Audio" with Brennan Anderson, Senior Audio Producer, Pyramind Studios; Steve Horelick who is a composer working in immersive formats; Paul Special, who works with ABC/Disney Television and Richard Warp, from Intonic. This session was all about VR, AR and XR have highlighted the importance of sound for "presence" in all content types from live TV to film to games and the opportunities they present for audio professionals. He heard from the panellists who are creating new 3D audio workflows and some of the challenges they are facing in working with these new formats. On Thursday I went to the session "Audio for Cinema: AC05 - Loudness Issues in Cinema—Is the Reference Lost?" chaired by Eelco Grimm, from HKU University of the Arts and Grimm Audio; with panellists John Fithian, representing the cinema owners and operators; Tom Fleischman, CAS who is a very experienced recording mixer; and Charles Q. Robinson from Dolby Laboratories research. This session looked at whether better sound systems reproduce louder movies but those louder movies generate audience complaints, which cinema owners respond to by lowering the playback level and whether lowering playback levels make dialogue unintelligible forcing dubbing stages to print louder and so to ask the question "Is the “sacred” reference level lost?" We heard about the research and work undertaken by Eelco which we have covered here on this site, as well as research undertaken by Dolby, and by John informally questioning the full range of cinema operators from the small family, single screen operators through to the large multiplex operator showed that it is the trailers that tend to generate the complaints, which then means that the cinema staff turn down the playback level because of trailer volume, which may not go back up fro the feature. The other data that came out from John's survey was that overall cinemas are very rarely playing back at Dolby Fader 7, most are somewhere between 4.5 and 6.5, even for the feature. Dolby has undertaken some more controlled research screening a range of feature films at different playback levels and then asking the audience to fill in a survey and one of the outcomes of this research showed that reducing the playback level didn't have an impact on intelligibility, but there was some criticism from the floor that one of Dolby's conclusions from their research was that the Dolby reference level system is alive and well, when virtually everything else including research from Steven Ghouti's survey which we have featured on this site, shows otherwise. The last session I want to highlight was a session entitled "Tech Behind the Tools: Production to Playback" chaired by Lisa Ferrante-Walsh, Director of Engineering at iZotope with an all-female panel, which is an excellent role model for encouraging women into the tech industries. We first heard from Hannah Robertson, DSP Engineer at iZotope who walked us through several new features from recently released iZotope products to demystify the development cycle of a plug-in: from the ideation stage to research, implementation, sound design, audio quality testing, and user feedback. Next up we heard from Marina Bosi, Ph.D. who is Consulting Professor at Stanford University and a Founding Director of the Digital Media Project and she shared about the development work on perceptual audio coders (e.g., MP3/AAC) that have become part of our daily lives, living in mobile devices, DVDs, webcasting, etc. Marina has helped advance the field of perceptual audio coding, and she provided a brief overview, new developments and sound demonstrations to illustrate the impact of this technology. Then we heard from Veronique Larcher, Ph.D.who is Director of AMBEO Immersive Audio at Sennheiser on the VR Production Workflow and she reviewed the constraints and tools for on-location VR audio capture, VR audio mixing and monitoring, and finally VR audio experience by the greater numbers on VR platforms or apps showing how putting early prototypes into the field in the hands of selected users helped speed up the development of the Sennheiser Ambeo mic and how the partnerships formed with other brands like Zoom and Noisemakers is working well for their users. Finally, we heard from Vanessa Li, who is a Software Engineer at Pandora on Content Delivery and Management. Whether we like it or not, demand for music consumption has shifted from physical albums to downloads to online streaming, new standards and protocols are emerging as the music industry business practices have adapted. and Vanessa shared some of the technical challenges that Pandora and other on-demand streaming platforms are facing around content delivery, storage, metadata rights business logic and audio streaming. 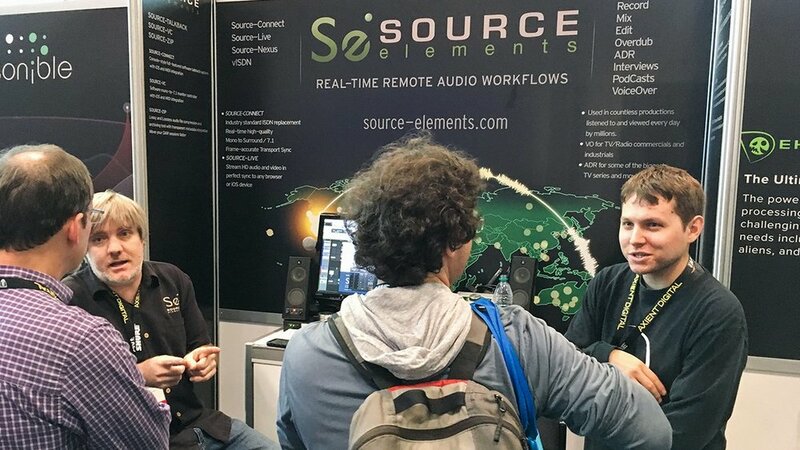 The AES show will be back at New York next year with the trade show running from October 17th to 19th 2018 and the convention running from October 17th to 20th 2018, maybe we will see you there?